Hair loss? Look for solutions!! 1.Eat nutritious: Eating nutritious foods like green leafy vegetables, fruits, salads, dry fruits, egg, fish etc will make your hair healthy and look shiny. You should always watch what you eat. 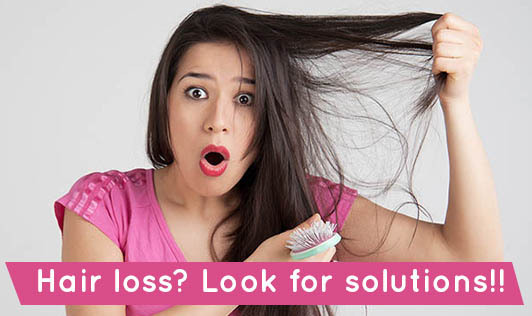 Eating deep fried foods, stale foods can make your hair lose its nutrition. Maintain a balanced diet. Eat on time and do not skip meals. 2.Drink plenty of liquids: Drinking plenty of liquids will remove toxins out of your body there by making your hair look healthy. 3.Avoid plenty of chemicals: Using many brands and products will make your hair lose its nutrition as each shampoo or conditioner may have different chemicals. Trust on one product and continue using it. 4.Oil massage: Go for an oil massage weekly once. Let it be good quality oil. It can be a coconut oil or olive oil. Massage in circular motion and leave it for a couple of hours. 5.Steam your hair: Steaming your hair after oil application will makes the pores open and dead cells to come out and eliminate. Do not take head bath just after steaming as this will lead to hair fall. Leave a gap of 1.5-2 hours for shampooing. 6.Shampoo it gentle: Shampoo your hair in a gentle way. Do not rub your hair harsh or too soft. Let it be soft and in circular motion. 7.Deep condition your hair: Deep condition your hair weekly once. Use a good quality conditioner. Conditioner helps to maintain the shine of your hair. When applying conditioner, be careful that the conditioner does not enter the scalp skin. It damages the hair. 8.Do not blow dry: Do not blow dry it with a hair drier. You will lose more hair when you hair dry. Gentle wipe it with your towel and leave it to dry. Do not comb wet. When combed in wet it removes tangles and makes your hair look straight but this is one of the common causes for breakage. 9.Avoid hairstyles: Hair style once a while is good. Hair styling every time can spoil your hair texture and look. 10.Sleep well: This is one of the best keys to keep your hair healthy. Sleep keeps you in relaxed mood and help remove toxins for that day. Each day sleep will rejuvenate your system and will keep you fresh. 11.Cut your hair: If you feel you are losing a lot of hair, go for a short hair cut if your hair length is medium. If you have a long hair cut the split end and makes it look neat. Each day losing around 2-100 hair is common for all of us. Use these tips to protect your hair from losing more than 100 hair. Cover your hair with soft cloth when you go out. Your hair will make you look beautiful and gorgeous. Cheers for your looks.